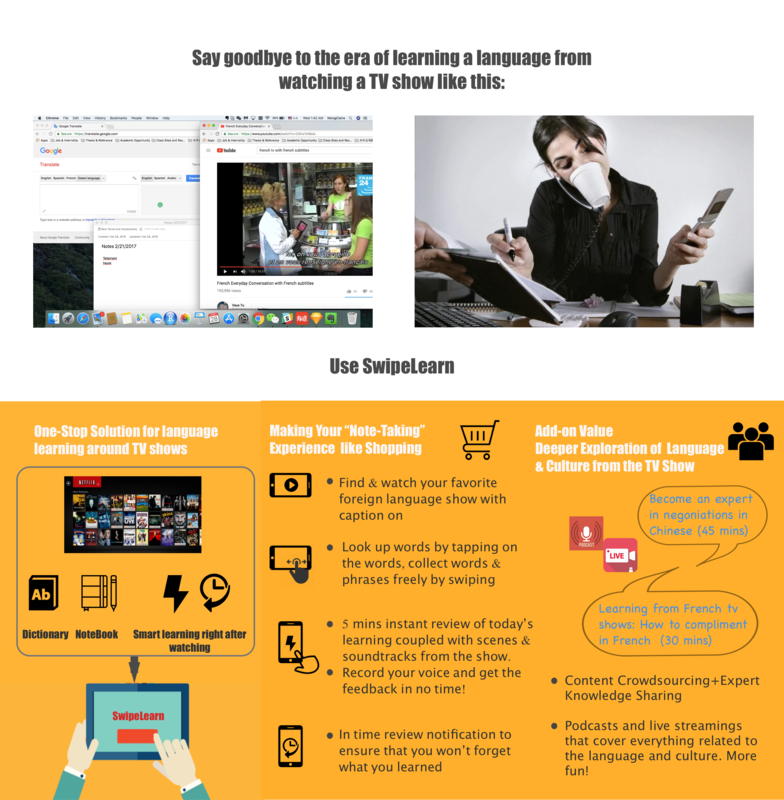 Watching TV shows in the target language should potentially be a great learning resource! However, 1) Having several windows open on laptop or mobile phone and switching back and forth for watching, word-lookup, and notes-taking is PAINFUL. 2) People never remember/are motivated to come back to their learning notes. Keep Old-school way of learning: Having different windows opening for tv show watching and language learning. 2. Language learning apps: Duolingo, Rosetta Stone, etc. Problem: 1) Limited and outdated learning content, more for beginners. No real-life contexts. 2) Low LTV: They might be effective, but customer acquisition is hard and retention rate is always bad. 3) High Price: Most of them charge $100-$250 annually. Fast caption curation from the TV show: without breaking the watching flow, the user can lookup, select, and store any words/phrases from the screen caption by tapping and swiping. 2. Seamless and Instant micro-learning right after watching and spaced repetition optimizes learning. 3. Podcasts digging deep into the language and culture from user’s favorite shows. Auto-renewing Subscriptions + Freemium (with 1-month free trial): Free functions: instant caption translation Add-on Service: (1)Subscription ($2.99/ month) for caption curation + tv show language micro-learning plan. (2) Subscription ($15/6 months, $25/year ) for unlimited access to podcasts and live streaming.